Alex Ross reports in the New Yorker that Valery Gergiev’s annual income is said to be $16.5 million. Recordings of Hans Gal's Symphonies by Kenneth Woods and of Missy Mazolli's new opera about Isabelle Eberhardt are just two important recent projects that relied on crowdfunding. 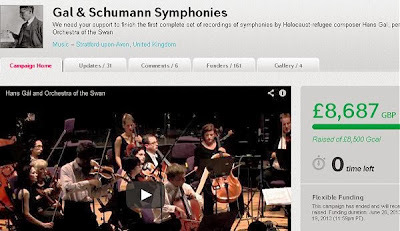 $13,500 was needed to deliver the acclaimed Hans Gal Symphonies; which is 0.08% of the amount reportedly paid each year to Gergiev by arts organisations around the world. As funders search for yet more savings, what is the defence against the accusation that classical music still has more money than sense?